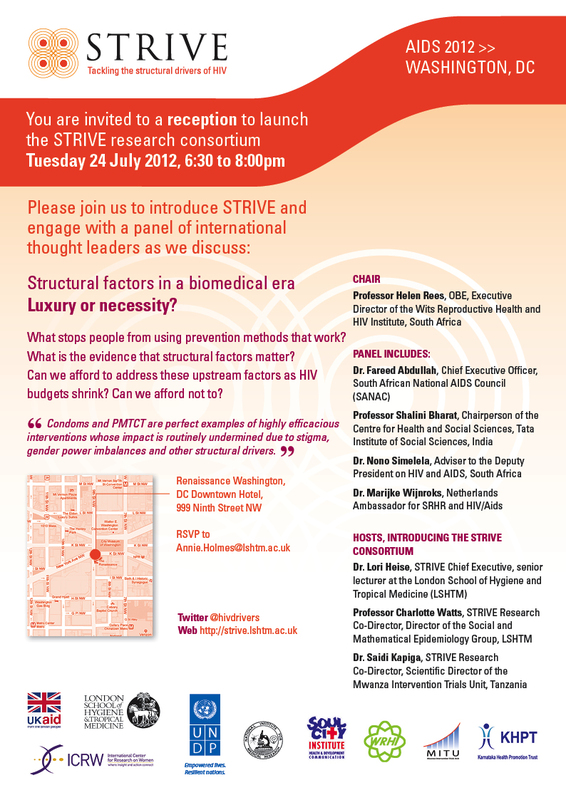 An international panel from the AIDS community will discuss this provocative question at a reception to launch the STRIVE consortium in Washington, DC on Tuesday 24 July 2012. What stops people from using prevention methods that work? What is the evidence that structural factors matter? Can we afford to address these upstream factors as HIV budgets shrink? "Condoms and PMTCT are perfect examples of highly efficacious interventions whose impact is routinely undermined due to stigma, gender power imbalances and other structural drivers." Join us for the reception and panel discussion on Tuesday 24 July from 6:30 to 8 pm at the Renaissance Washington, DC Downtown Hotel, 999 Ninth Street NW. Add the STRIVE launch event to your calendar. For an overview of the arguments and evidence on structural drivers, read an editorial by STRIVE researchers and others.